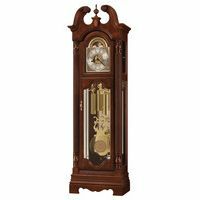 Hermle Anstead dark oak grandfather clock with 9-tube tubular chime movement, featuring triple chimes including Westminster, Whittington and St Michaels chimes. 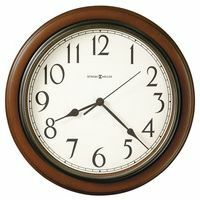 Features a handcrafted solid oak case made in Virginia. Movement and all accessories are made in Germany. 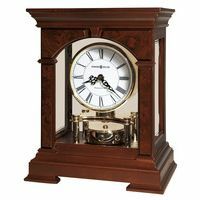 Cabinet is complimented by a graceful bonnet pediment. Features raised hand rubbed burl veneer overlays in the crown and base. Mechanical 8-day movement features automatic night shut off.